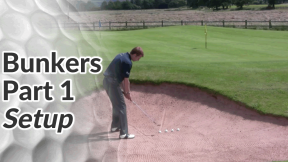 In this lesson, we’ll see how to play a bunker shot where the ball is sitting on a sloping lie. 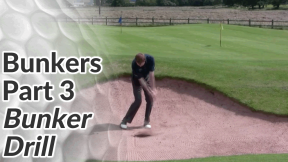 You’ll actually come across a sloping lie in the bunker more often than you might think – the ball can easily roll up the lip and leave you an uphill or downhill lie. On an uphill slope the ball is going to come out quite steeply – which will help us stop it quickly on the green. Playing from an upslope on a fairway we would usually take a lower lofted club to compensate for the very high ball flight. 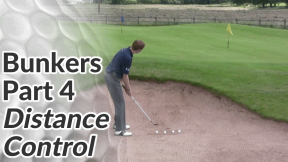 However, on an upslope in a bunker you’ll probably have a bunker lip very close by to clear. 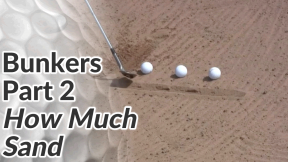 So opt for your lofted sand wedge as normal. Setting up, take a much wider stance to anchor yourself into the hill. Tilt your shoulders so they are aligned with the slope and keep the club face open as you would do normally. Keep your legs very still – there should be little or no leg movement for the duration of the swing. 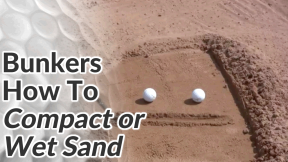 Strike the sand about 2 inches behind the golf ball as normal, with the ball slightly ahead of centre in your stance. 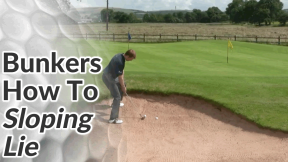 As you strike through the ball, allow the club to ‘chase’ up the slope – we want to avoid the club digging into the sand bank and allow the club’s travelling up the slope to give the golf ball its height. 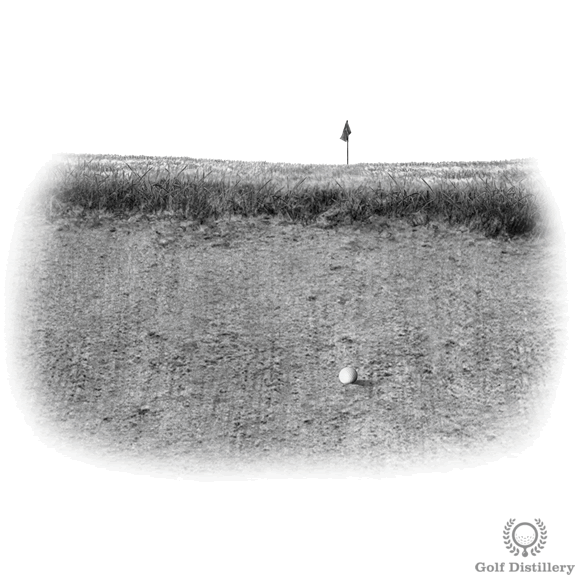 You’ll need to hit the shot with enough power to land the ball close to the flag – the height on this shot means you’ll get very little roll. On a downhill slope the ball is going to fly out at a shallower than normal angle. This will also give it more roll. Open the club face as much as possible. 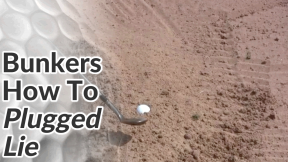 You may also want to use a 60 degree lob wedge over your sand iron here. To minimise the effect of the slope, tilt your shoulders down along the line of the slope. The bodyweight will lean a bit more into the left side (for the right-handed golfer) as well. Again, take a much wider stance to give yourself good balance through the shot. 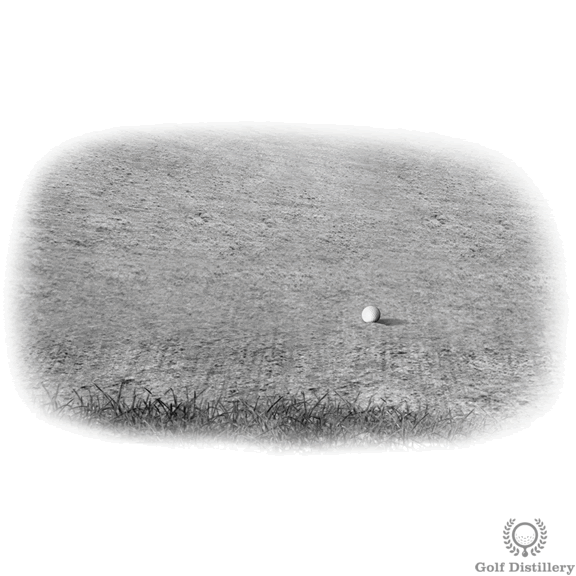 As you strike through the ball, feel as though the club head is chasing down the slope. 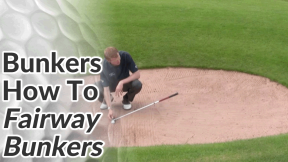 This will help to minimise the chance of catching the ball thin. Accept that from a downhill sloping lie, anything out of the bunker first time and anywhere on the green is a good result.